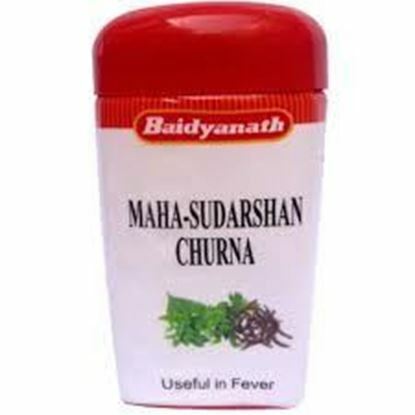 Properties Weight120 (gms) Dimensions6.4 (cm) x 6.4 (cm) x 11 (cm) About Mahasudarshan Churna Mahasudarshan Churna is a classical Ayurvedic medicine. It is used in treatment of fever due to various reasons. It promotes perspiration and excretion of urine. It is an ideal remedy for all type of fevers and malaria. It is also used for diseases of liver and spleen. Information about Baidyanath Kaishore Guggulu Tablet Pack of 2 Baidyanath Kaishore Guggulu Tablet contains Gokshuru, Amruta, Guduchi, Tryushana, Vidanga, Danti, Trivrit, Ghrita and Trikatu. Gokshuru is an herb that promotes natural urine flow. It also soothes membranes around the urinary tract. Trikatu is also added to support a healthy blood flow. It also improves digestive functions in the body. 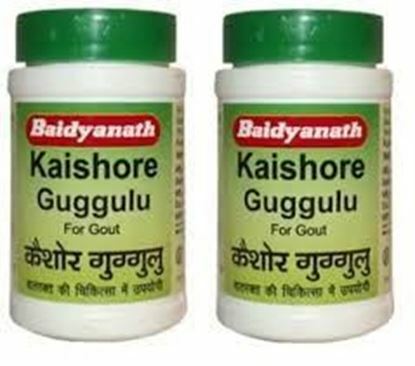 Kaishore Guggulu Tablets are used to reduce the total amount of uric acid in the body. This reduces the risk of inflammation and constipation among other bowl-related threats. It also makes it easier for a patient to expel urine. Administered in malignant ulcers, leprosy, boils, fistula, scitica, and otorrhoea Direction for use: Baidyanath Kaishore Guggulu Tablet should be taken twice a day. About two to four tablets should be used in each dose. Use under medical supervision.